Dear visitors of the homepage about the "150 years of diplomatic relations between Japan and Switzerland"
The “150 years anniversary of the establishment of diplomatic relations between Japan and Switzerland” is gradually drawing to its end. In February of this memorable year His Excellency President Didier Burkhalter visited Japan and in June H. I. H. the Crown Prince of Japan paid an official visit to Switzerland in his capacity as patron of the “150 years anniversary of the establishment of diplomatic relations between Japan and Switzerland” on the part of Japan. Besides, many events took place in numerous places in order to commemorate this anniversary. The success of all these events is mainly due to the kind cooperation and the enthusiasm of all participants. Concurrently, the countless visitors who attended the events added to this year’s success and thus contributed to promoting mutual respect and understanding between Japan and Switzerland. Thus, we would like to express our deep gratitude to you all for your support and commitment. The Embassy of Japan in Switzerland, encouraged by the positive energy generated during the anniversary year, will continue its efforts to further develop the exchanges between Japan and Switzerland. Last but not least, we wish you all a merry Christmas and a happy New Year! Endorsed anniversary events will be listed in the event calendar which will be updated regularly. 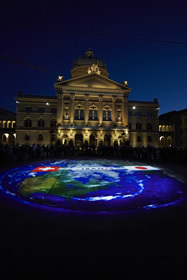 On the 28th and 29th of September a Light-Performance at the Bundesplatz in Berne were conducted by the Light-Design Artist Motoko Ishii and the producer of the event Akari-Lisa Ishii on the occasion of the "150 years of diplomatic relations between Japan and Switzerland". The opening ceremony was held by Alexander Tschäppät, Mayor of the City Berne, Ryuhei Maeda, Ambassador of Japan in Switzerland and Johannes Matyassy, Head of the Asia and Pacific Division of the FDFA. 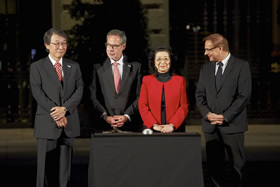 Together they switched on the light, whereby the ground of the Bundesplatz was illuminated by pictures of Japanese woodcut prints, famous ceramics and other traditional Japanese subjects. 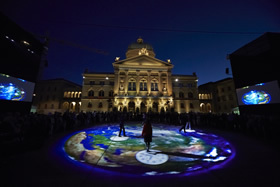 The numerous spectators enjoyed the possibility to walk on the interactive projection and had obviously a good time.